No longer need to roll the person on their side - only roll the person if the airway IS obstructed. No longer required to check for a pulse - We determine an individual to have no signs of life if they are unresponsive and not breathing. Cardiopulmonary resuscitation (CPR) should be commenced when there are no signs of life, that being when the patient is unconscious and unresponsive. Give two breaths, not five, initially and then begin compressions, minimising interruptions. Rate remains at 100 compressions a minute. No longer is it recommended to measure the sternum for placement of hands to initiate compressions - visualise the centre of the chest and compress at that point. 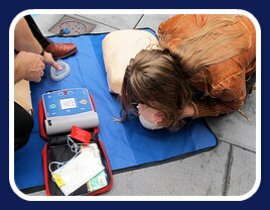 CPR ratio - is now 30 compressions: 2 breaths for adults and children, regardless of the number of rescuers. Previous ratio was 15:2 for adults. No, the superseded rates and ratios have saved many lives over the years. However, the new guidelines are thought to improve on the technique of the past by being easier to remember and emphasising the importance of compression over rescue breathing. There is no need to roll a casualty on their side if their airway is clear of vomit or other fluids or objects. Only when the airway is obstructed should the casualty be rolled on their side to attempt to clear their airway. The airway can be appropriately seen using the pistol grip and head tilt whilst the casualty is lying on their back. Why is "Mouth to Mouth" now called Rescue breathing? The term 'Rescue Breathing' is already being used universally. This change was made as 'Rescue Breathing' best represents the skill and action that is required by the casualty. Healthy adults breathe between 12 - 18 times per minute. Signs of abnormal breathing may include gasping, noisy breathing such as wheezing or gurgling, breathing that is excessively fast (greater than 21 breaths per minute) or pain on breathing. Infrequent gasps of air may be seen in a cardiac arrest. Gasps are not an indicator of effective breathing and CPR is required. How come the C in DR-ABCD is now compressions? Under the new CPR guidelines we are no longer required to check for a pulse. We determine if the person has no signs of life if they are unresponsive and not breathing. So we are no longer checking the circulation by taking the pulse. The requirement and emphasis is to perform compressions. Checking a pulse on a casualty is very difficult and can also take time to find. This time is needed for providing effective compressions that will pump vital oxygen to the organs that need it to stay functioning. A casualty with no signs of life is now defined as a casualty who is unresponsive and not breathing. How come CPR ratio changed from 15:2 to 30:2 - compressions:breaths? International studies demonstrate that more frequent chest compressions may result in an increased chance of survival. It is also thought that the new CPR guidelines will be much simpler to teach and easier to remember. These new CPR guidelines have been brought in to attempt to simplify the steps of CPR as well as implement what will help the victim. What is the last D in DR-ABCD? 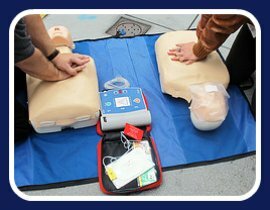 D = DEFIBRILLATOR (AEDs)- The full name for defibrillator is Automated External Defibrillators (AEDs) and they are devices that shock the heart back into a normal rhythm. It can be very stressful to find someone needing CPR but when it comes down to it, doing something is better than doing nothing. Your contribution may save someone's life.